All Power-Cubes can be screwed down to the main frame, by removing the 4 bottom M3 screws and drilling holes into the frame. Then reinstall the screws trough the frame. 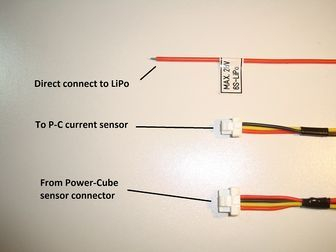 The sensor input connector (S) has an voltage sense wire, which can be directly connected to the main battery (max. 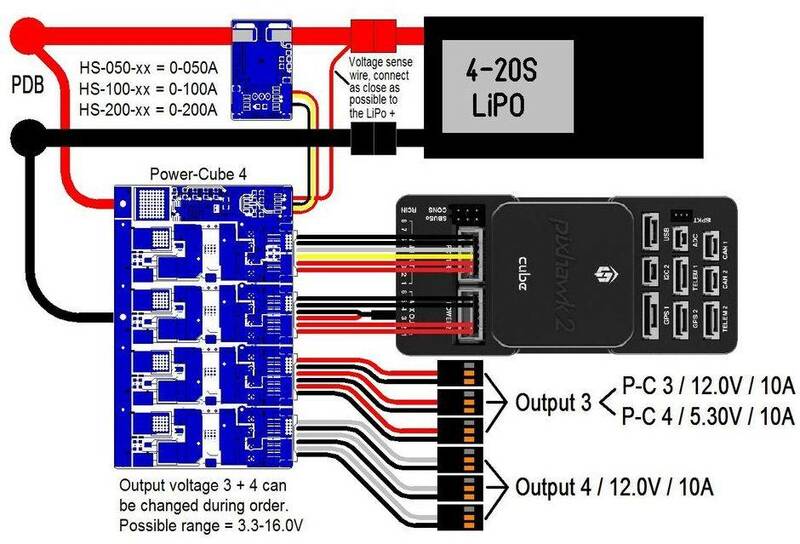 28V / 6S LiPo). If an higher input voltage is required, then one of the 2 supplied resistors need to be installed "in series" to the voltage sense wire. -> Only install one of the two resistors, never both ! The Power-Cube comes with an final test result which provides the voltage divider for the standard 6S configuration, but if any of the 2 resistors are installed, then the voltage divider will change ! The resistors have an tolerance of 1%, so please confirm the correct voltage measurement with an DVM and readjust the voltage divider if necessary. S Molex / Clik-Mate / 1.25mm / 5p -> Connection to PC-100/200 current Sensor and voltage sense wire. This cable is standard delivery and comes with any Power-Cube. 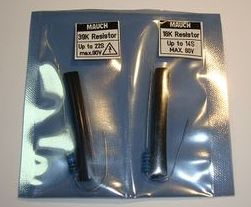 Please insert the 18K resistor for voltage readings up to 60V or the 39K resistor for up to 90V into the wire. Use the supplied shrinking tube for isolation. 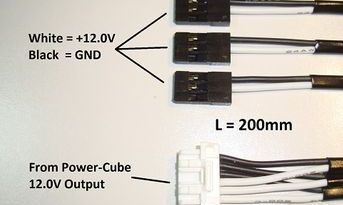 The "middle" cable (Molex / Clik-Mate / 3p) connects to the P-C sensor board (100A or 200A), or to the Sensor Hub X8. 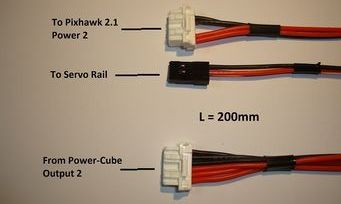 This cable is standard delivery for Power-Cube 2, 3 and 4. 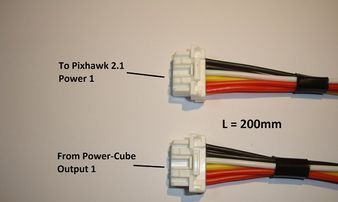 Connect the connector with 6 cables to the output "2" at the Power-Cube and the one with 4 cables to Pixhawk 2.1 / Power 2 input. 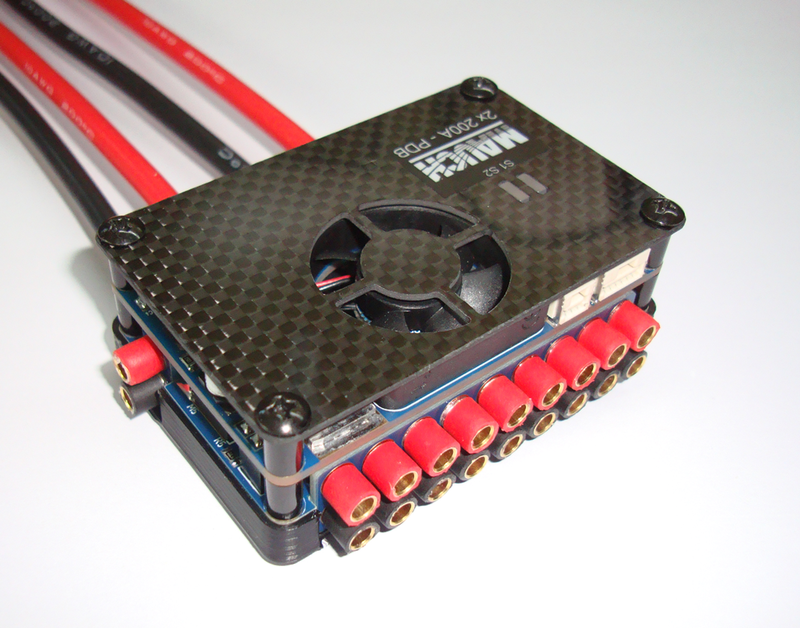 The JR connector can be connected to the servo rail at PX 2.1, to power up opto ESC's or any other equipment. Please do not use it to power up digital servos, or any other high current consumption equipment. 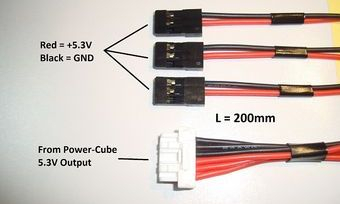 REM: If for Power-Cube 2 an higher voltage than 5.3V (for example 12.0V) is ordered, then this cable will be replaced with one of the cables from position 3 or 4 with 3x JR connectors. This cable is standard delivery for Power-Cube 4. If you order Power-Cube 3 with 5.3V at output 3, then this cable will be delivered. 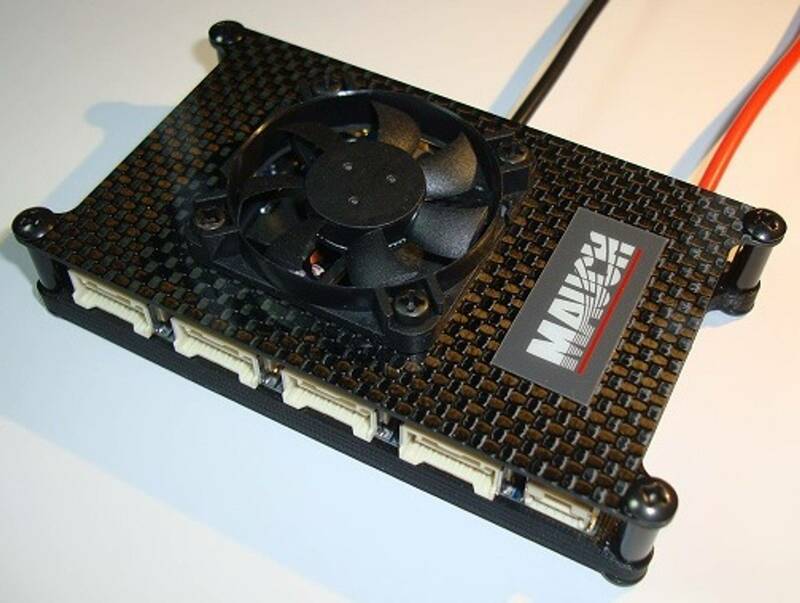 Connect it to any high power consumption equipment. 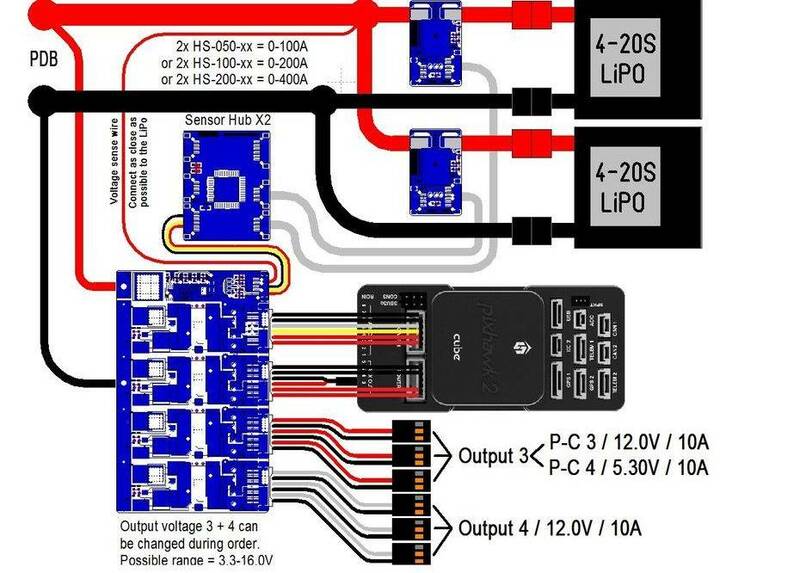 For example connect 2x JR to the servo rail to power up digital servos and the 3rd for LED's or anything else. This cable is standard delivery for Power-Cube 3 and 4.